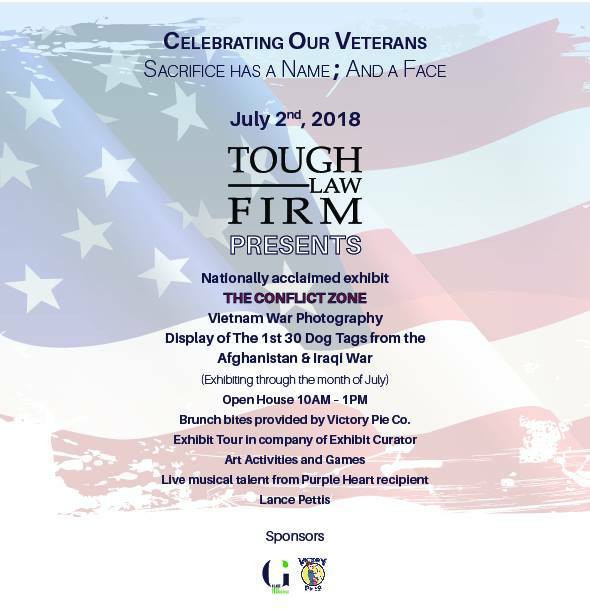 The Tough Law Firm is proud to present a nationally acclaimed exhibit, The Conflict Zone, a Vietnam War Photography Display of The 1st 30 Dog Tags from the Afghanistan & Iraqi War at Glade Cultural Center for an open house on July 2nd from 10AM - 1PM. There will be brunch bites provided by Victory Pie Co., an exhibit tour in company of Exhibit Curator, art activities and games and live musical talent from Purple Heart recipient Lance Pettis. The exhibit will remain open through the month of July.